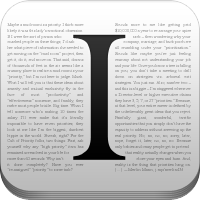 Instapaper is an Android, iOS, and Chrome app which allows you to save web pages for offline reading. It is great for saving long blogs and articles for later reading. Basically, it you haven’t figured this out yet, you don’t need internet connection to view what you have saved. That’s kind of the point. This app seems great and would be very useful for most. I know I hate not being able to view something for a short time if I do not have wifi. For $3.99 I think that it is worth it for what it offers.